The Panasonic GX8 Micro Four Thirds mirrorless camera is now listed as discontinued at B&H – see this and this page (Adorama still has some in stock). The GX8 was announced on July 16, 2015. The Canon EOS 7D Mark II DSLR camera body is now listed as discontinued at B&H (the lens kit version is still available). 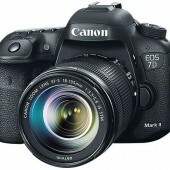 A new Canon EOS 7D Mark III model is expected to be announced soon (most likely in the first half of 2019). The Pentax K-1 full frame DSLR camera is now discontinued and a new Mark II version is rumored to be announced soon. The Pentax K-1 was announced on February 17th, 2016 and is currently selling for $1,779.95.